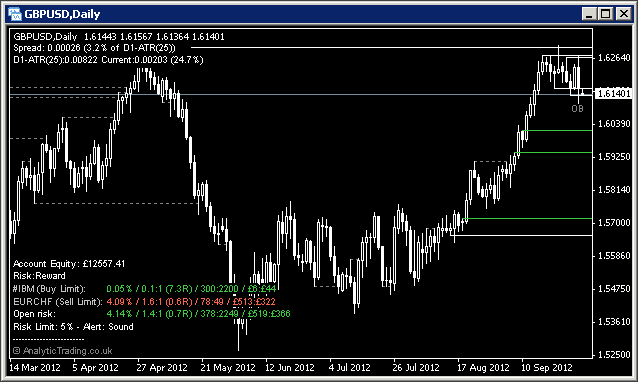 This template is again, based on the Bias and Levels template, with the Risk Manager Indicator information. Note, the default risk settings are set to an amount we believe to be reasonable for our own trading strategies – but you MUST check and set these for your own risk profile, and remember to check them each time you load, save or update the setup for this template if you are relying on this information as part of your trading plan. This template gives you a quick way to set your charts with the default indicators, including the RIsk Manager EA information and functionality relevant to the instrument you are monitoring or trading. We will have this template, including the Risk Manager, applied to at least one chart when we have any open orders or trades, and then to each chart, which we keep open, for any instrument we are trading. If you are trading multiple instruments, not all included on the same default profiles that we provide with the MetaTrader Pro setup, then we recommend you save a new Profile for the instruments you have open orders or trades for and apply this template to each of those charts and keep that profile open all the time you are trading. You can always start up another instance MetaTrader using Birt’s multiple instance launcher if you want to look at other profiles separately for analysing multiple profiles and markets. This template gives us continual feedback on how our trades and orders fit within our risk profile; when we have trade funds available to scale into trades or trade different instruments; and when to scale our or close trades to keep our equity curve from sustaining uncomfortable drawdowns.